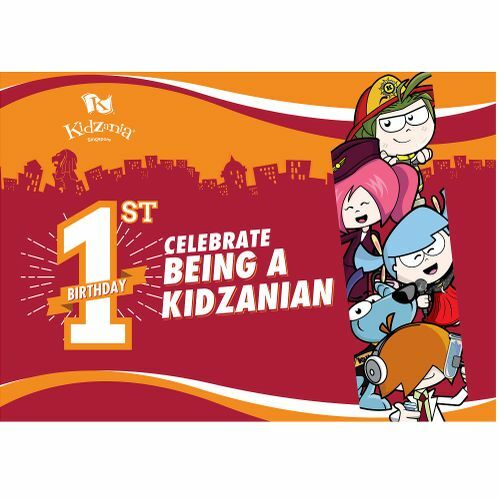 KidZania Singapore turns one this April, and everyone is invited to our birthday celebration! Come celebrate with us, and discover what it means to be a KidZanian as the City comes alive with a series of exciting events. What does it mean to be a KidZanian? Share with us what you love most about KidZania on our “I love KidZania” Wall, and inspire others with your dreams and aspirations. What’s a birthday celebration without cake? Join us for a mini party and cake cutting on 9 April (Sunday) from 2:25pm to 3.35pm, and grab a selfie with our RightZKeepers too! Kids can also stand to win attractive goodie bags by participating in stage games, or grab the balloons that will be released from the City Clock balcony! A surprise awaits all those with a balloon! Embark on the KidZania Quest, and learn the culture and heritage of KidZania as you explore all corners of the City for answers to your question card. Complete the questions and you will receive an exclusive goodie bag that contains merchandise from our various industry partners. Spend a minimum of SGD$50 and take home a limited edition KidZania Singapore 1st Birthday Tote Bag to help you bring home all of your kids’ precious role-play giveaways. You will even stand a chance to win admission tickets to other KidZania Cities! The celebrations are not just about us! That’s why we are extending great discounts for all kids celebrating their birthdays in April too! 30% off Kid Tickets for all kids aged 4-17! Valid daily, excluding Singapore Public Holidays. For Kid walk-in tickets only. Valid daily, excluding Singapore Public Holidays. Present your kid’s PaZZport at KidZania Singapore’s ticketing counters to enjoy 30% off 1 Kid and 1 Adult walk-in tickets. Limit to 5 sets per admission. Part of the world’s fastest growing family edutainment phenomenon, KidZania Singapore presents kids with diverse learning opportunities through more than 60 role-play adventures. Kids get the chance to live out their aspirations and discover their passion by taking on different real-world professions, and develop life-skills through their own experiences. They can learn financial literacy as they earn their keep in the form of kidZos, KidZania’s official currency. Parents and guardians can now join in the fun and play an active role in their kids’ role-play and learning experience. KidZania Singapore has curated a selection of activities that adults and kids can do and learn together. These activities can be found at the Art Studio, Aviation Academy, Coach Station, Convenience Store, Courier Service, Makeup Atelier, Newspaper Edition, Stadium, Theatre, Vault, Water Quality Assurance Plant and Window Washing establishment. For more information and purchase of tickets, please visit www.kidzania.com.sg or KidZania Singapore’s official Facebook page https://www.facebook.com/KidZaniaSingapore.